It's quite rare that I get the chance to review the work of an author I know, an actual friend and it has been a most unusual experience. 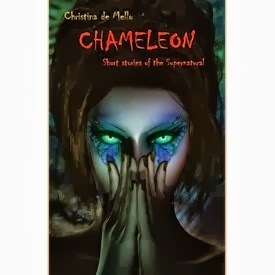 Lucknow author Christina De Mello is a smart, cheerful lady with a ready smile and a clever sense of humour. So when I came to know that she was having a work of fiction published, I was naturally curious to know what type of content the book would have. I never, in my wildest dreams, could have imagined that she would come up with a collection of horror stories. "Paranormal stories, right?" was my immediate reaction. She gave me one of her charming smiles. "Horror stories," she replied. No two ways about it. I always imagine the authors of such dark, forbidding stories. would have an appearance to match, but as it has been said before, 'looks can be deceiving.' That's certainly true in this case. This is a collection which is quite encompassing. Nine stories in one volume and let me tell you, they chill the blood. The author takes you on quite a journey, to a variety of locations, both Indian and foreign, from the material world to the supernatural. The truth is that the natural world is not too far from the supernatural world. A mere veil separates the two and sometimes that veil slips and the two intermingle and when they two, the results can be pretty terrifying. The stories are quite a mixed bag, some historical, some contemporary and some both. There's quite a malevolence in the supernatural entities who make their appearance in this book. The story featuring my city of residence, Lucknow, THE ROTTING FACE, had me riveted. A bunch of middle-aged Anglo-Indian venture out on a trip to see a deserted temple and find themselves caught up in a terrifying situation. The story brings alive the congested atmosphere of north India with that tension which is always bubbling under the surface. ISLAND OF DOOM is a swashbuckling adventure set in and around South America, a few centuries back. ANGEL OF THE DEEP brings you to a submarine in the early twentieth century. CHAMELEON goes back to the time of the British Raj, when a young English lady arrives in south India to meet her fiance and finds him missing while the locals remain tight-lipped. Then there's GUARDIAN OF THE WOLLEMI, which brings you to Australia, not to the big city Australia but to the wilderness and the old aboriginal haunts. THE OUROBOUROS FACTOR introduces us to some Indian prisoners, escapees of a Japanese POW camp in the jungles of Thailand. We also travel to Egypt and Japan and the mysterious Mount Kailash in Tibet. And it's quite a journey. These stories are very dark and redemption never seems to arrive. Yet the author's voice is that of the true storyteller, hypnotic. You find yourself turning the pages, eager for more. There are no vampires nor werewolves (although I spotted one shifter, a must in paranormal fiction today). For someone who's looking for a read to charm and intrigue and surprise, this book couldn't be more recommended. A word of warning - you'll find yourself looking over your shoulder for a couple of days after reading this. You never know who's watching.